Hey everyone! Steve here from Standard Library. I'm excited to make the first non-founder post on our blog! While we've promised an update at least once every two weeks, we've been firing on all cylinders since ServerlessConf San Francisco. It's only been a week since our last update, but we're so excited about what we're working on we wanted to get it to you as fast as possible. I am happy to introduce two new features to Standard Library and Code.xyz — improved error tracing for better observability of your APIs running on our platform as well as a brand new project selection and management interface. Here it all is! 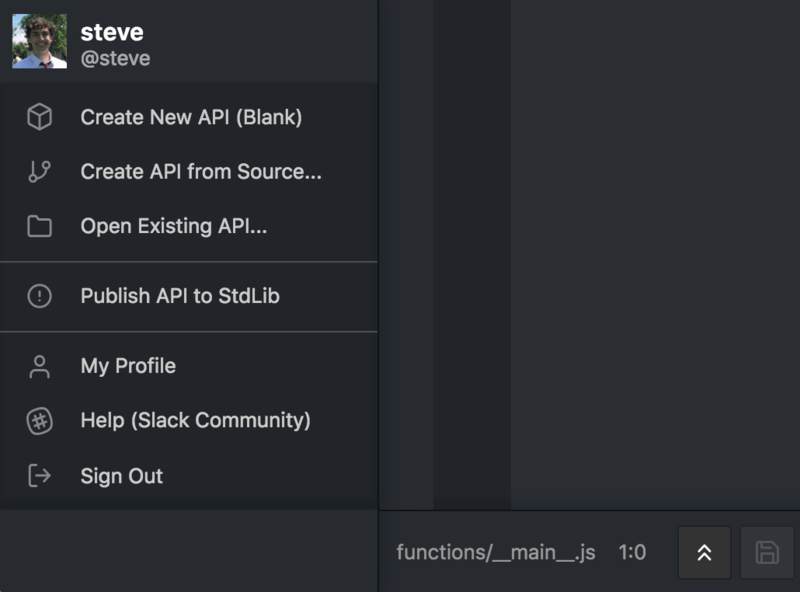 Newly deployed APIs on Standard Library now automatically log error stack traces and full messages to aid debugging. This is especially useful for testing and gaining visibility into webhooks, where you are not testing your function directly from Code.xyz or your command line. Both normally thrown or returned errors and uncaught exceptions will show up in your function logs, which are available from your Standard Library dashboard or from your command line. You can check out the docs for full details here. When autosaves were added to Code.xyz a few weeks ago, we noticed that the current way of selecting projects was becoming a bit cluttered. 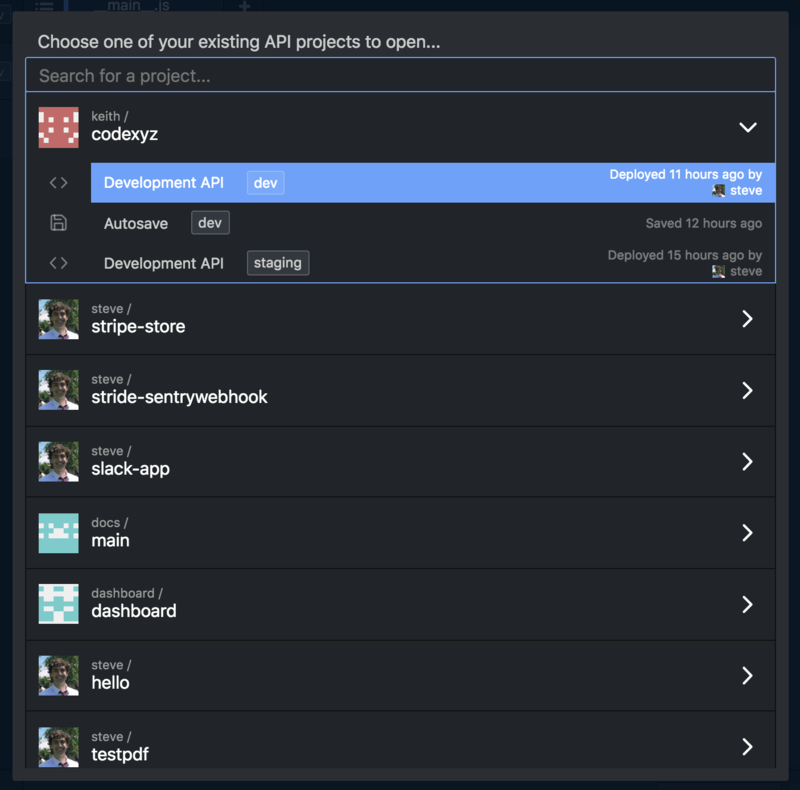 We updated the project selection window to group every version of a service together including autosaves, development APIs and released APIs. You can find the new finder by hovering over your username in the bottom left corner of Code.xyz and clicking Open Existing API. Once your projects load, you can click or arrow through to expand a service. It will display all available versions that you can fetch, sorted by the last time that version was updated. For instance below, you can see that I have access to several versions of Code.xyz available to download (did you know that Code.xyz was built on Standard Library?). If you would like to check out the new UI yourself, feel free to play with an embedded version of Code.xyz below! As usual, thanks for taking the time to read our updates! You'll start reading updates from more of our team as we continue to grow. If you're looking for a new role, please don't hesitate to check out our careers listing. Stay in touch with us by joining our Slack workspace, or follow us on Twitter, @StdLibHQ.